In a SHTF event, when food delivery systems are down and the stores quickly run out of all food supplies, how will you keep eating healthy? Does healthy eating have to include the “grocery store staples?” I think there are ways to eat healthy, or at least avoid super unhealthy food options, even when the world runs amok. Everyone used to prepare for winter by putting up the summer and fall fruit and vegetable abundance. 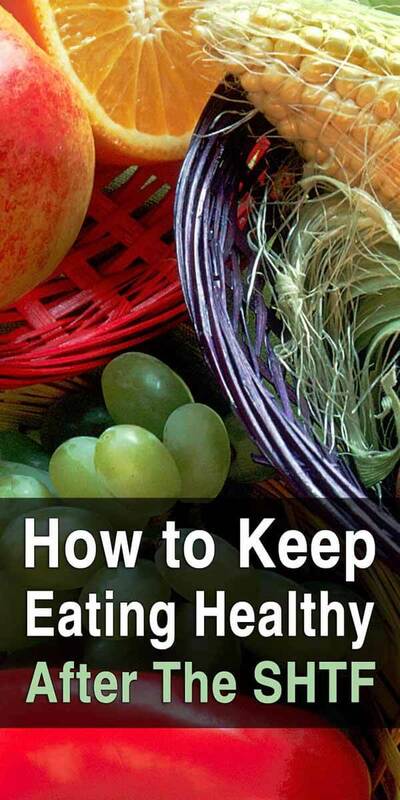 Eating healthy is important at any time, not just after SHTF, though it will likely be paramount to survival after. Many canned and processed “survival” foods are high in sodium or added sugar. While these additives make the end product more tasty and appealing, it could well end up damaging your body. Added salt could very well be the worst. Too much salt can cause an imbalance with your body fluid levels. Excess salt has also been linked to high blood pressure, and after the SHTF you may not have the ability to deal with a heart attack or stroke caused by high blood pressure. So keep salt intake low if you have high blood pressure or a family propensity for it. Making your own canned food and learning to cook from dried and minimally processed stored foods can help minimize salt consumption. Also on salt, if you have low blood pressure, you will want to keep at a moderate consumption level. Low blood pressure is just as dangerous as high, if not more so as there are fewer ways to address low blood pressure. Sugar can weaken your immune system, while the crash of a sugar rush can lessen your ability to focus or perform physical activity. Avoid added sugar in your preps, and stick with natural sugar sources or those that have other added benefits, like the antimicrobial action of raw honey. The more processed your food survival preps are, the higher the likelihood that they will contain added salt and sugar. Prep plain dried foods like dry beans, whole nuts, and dehydrated fruits and vegetables to keep the sneaky salts and sugars to a minimum. In a SHTF situation, you are eating to fuel your body for peak performance. Too many additives can adversely impact your health, and thus your ability to survive when your body needs to be able to act and react effectively. Too much salt impacts your blood pressure and water retention. A sugar high, and crash, can cause brain fogginess, muscle shakiness, and general distraction. Are salt and sugar evil? No, you need salt to for your body to function, and some sugars occur naturally and are beneficial, but you don’t need the sneaky added sugars and salts that are used to make over-processed food appear edible after storage. Not to mention the processing may not give you the best bang for your nutritional buck either. If the grocery store is out of everything, the only place you can “shop” will be in your preps. If you’ve only stored unhealthy food, you’ll be stuck eating unhealthy food. If you’ve stored healthy food, you’ll have healthy food to consume. It is easy to buy beans, rice, and wheat in bulk, and cycle through using and replenishing it so that it’s always fresh. Fruit can be home dried, canned, and even fermented, while veggies can also be canned, dried, fermented, or kept in cool storage. Make sure you don’t forget to store and cycle through protein sources as well. This can include dehydrated cheese, dried meat, canned soup stock, or canned fish and other kinds of seafood. If you are hesitant about stocking protein sources, think of it less as prepping and more as stocking your pantry. Get the foods that will last in your pantry and that you enjoy eating while they are on sale or inexpensive to save money, time, effort, and possibly your life. This goes hand in hand with buying what you know you’ll eat. Dried beans may store well, be a very good protein and carb source, and be cheap in bulk, but they are useless if you hate beans, are allergic, or don’t know how to prepare dried beans. Same with canned, dried, freeze dried, and all other types of preps. While specialized survival food may be tempting, ask yourself if you’ll actually eat it and if the preservatives, flavors, sugars, and other additives are worth the convenience. An emergency is a huge stressor on your body. If your emergency preps are the food your body is already used to consuming, then that is one less stress on your body and you will be better prepared to face the other stressors. Your body does not need the added stress of a suddenly changed diet when it is trying to cope with an emergency. Further, stocking up on the foods you normally eat and/or gradually transitioning your diet to match your stockpiles will also build a natural stock and refresh cycle so you can avoid throwing out past-dated food. Make sure you prep cooking supplies as well. Having food on hand does nothing if you have no way to prepare it. Whether it is a propane stove, a solar oven, or an open fire, have some way to cook and practice cooking on it. It may be awkward, annoying, or frustrating at first, but nothing beats knowing for sure what, where, and how your next meal will happen when everything else is uncertain. Are you and your body used to consuming fresh tomatoes in January? Or lettuce and sugar snap pea salad in the heat of September? Learning to eat seasonally can help you stay healthy, no matter the circumstances. One of the things seasonal eating requires is a knowledge of what is in season and what will store for winter. Enjoy lettuce in its sweet spring prime, and dry any slightly bitter leaves to grind and add to winter soups as a vitamin boost. Several pounds of greens, dried and ground to powder, will fit in a quart jar. Target storable food, such as squash, which you can store in a cool hallway or cold room until spring foods begin coming in. Carrots, beets, and other root vegetables also store very well in a cold room, and late season apples and pears can last well into December. Most of the late fall foods can be stored through the winter, and will provide good nutritional value too. Spring and summer crops are the ones that must be processed, via drying or canning, for winter consumption. Working seasonally can help make you less reliant on the grocery store, and more reliant on your own garden, farmer’s market, and general local area. Also, it makes it necessary to know a few basic methods of food preservation, at least if you want to enjoy strawberry jam on your winter toast. Nutritionally, drying or canning your own locally harvested produce in the peak of ripeness will give you a better nutritional punch compared to imported ripened en-route fruits and veggies, whether fresh or processed. Canning and drying does reduce the nutrient value compared to fresh foods, but if you have a choice between making your own or buying commercially canned or dried foods, the home processed will be better. Also, home processing your preps means that you can control the additives. Make your own tomato sauce and you’ll know if there’s sneaky salt or sugar showing up. Gardening will provide you with the freshest veggies, fruit, and other foods. For an SHTF scenario, learn to grow nutrient dense foods like beans, peas, carrots, beets, and the like. This will help you get the most nutrient value out of your garden space. You can also target lesser known fruits and vegetables, or do wild gardening or permaculture to help keep your garden safe from desperate non-gardeners. Gardening also goes hand in hand with seasonal eating. Nothing encourages seasonal eating more than the taste of the first ripe tomato after eagerly watching it ripen on the vine, or the first fully ripe strawberry of the season. Further, doing your own gardening means you will know what the plants look like in all stages of growth. Then you can scout for abandoned gardens and transplant or harvest plants that others wouldn’t recognize. One other thing, unless you have a lot of space, don’t try to grow grains. They take up a huge amount of space for their nutrient and harvest values. Target foods that will grow prolifically in a small space and also have a high nutrient value for the most healthy after SHTF meals. Remember, gardening will also enable you to have healthy meals if your SHTF event is long term. Even the best stockpile will run out over several years, but your garden can give you a renewed harvest every year. In any situation, a small amount of fresh wild edibles can make a big difference to your health, and the SHTF will be no exception. Wild foraging enables you to take advantage of the plants, herbs, and trees growing naturally around you, either for food or medicinal purposes. Learning the trees now, like what trees are toxic, and what plants are good to forage for, will enable you to thrive and forage with confidence. If you are new to foraging, learn one or two high nutritional value trees or plants and work from there. In warm climates, carob is a very good plant to learn and a fairly tasty one to sample. In colder climates, plants like bulrushes, nut trees, or basic garden weeds like dandelion, make a good place to start. Even a basic pine needle tea can be good to start with if you’ve never foraged before. If you have your own property, you can build foraging elements into your yard and garden, and have a food source that melds into the background instead of being obvious. Like a garden, wild plants renew year after year, so you can restock every year. If you have young children, or even know that you prefer a limited range of dishes, start expanding your taste horizons now. This is particularly relevant with children or teens who may not want to try a new food or a new recipe that you concoct. Wild foraged, garden grown, and home cooked foods have completely different taste profiles to their store bought and additive filled cousins. If you want to start gardening, start with some plants you know and enjoy eating, and add one new plant or flavor. If you are wild foraging, find your first plant and identify it. Once you have identified it, try it on its own or in another dish. Some flavors, like carob, require getting used to. Sometimes a food will have an unpleasant texture prepared one way, and scarcely be noticeable as part of a different dish. With a family, introducing new foods and encouraging taste experimentation is a good way to help your family not balk at a change in their diet or how their food looks. I grew up with a “you have to try one spoonful” of every dish, and never had many challenges adapting to new foods or food presentations. Of course, doing this takes planning and some inventiveness, but it can be very fun and rewarding. One other thing that can help food adoption is using a wide range of herbs and spices. Using different flavors with familiar foods can also help expand the taste palette and give you more variety if you end up eating from your limited food stores for a long period of time. Not to mention that most herbs and spices have some health benefits, so are always good to have on hand and consume. As you can see, there’s no need to exclusively eat unhealthy high-sodium and highly-processed foods during a long-term disaster. With some head knowledge, creativity, and ambition, you can maintain a healthy diet without visiting Whole Foods or Trader Joe’s ever again.